We finally got our hands on a retail unit and we used it to re-run all of our tests - we've updated the relevant review sections. Always keen on experimenting with novel features, LG has had a few keepers (the dual camera), but it's usually quick to know a goner - wonder if you still remember the G5 and the one-off attempt at modularity. Meanwhile, the V-series of phablets was conceived as an alternative to the large-screened Galaxy Notes with a secondary display in lieu of a stylus. Well, that lasted for two product cycles, and the secondary screen is no more. Instead, the LG V30 is all screen. 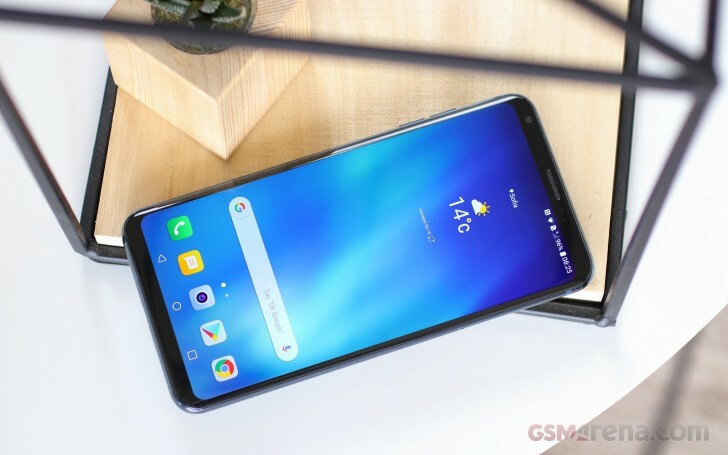 The LG G6 led the way in minimal bezels and extraordinary aspect ratios this spring with its 5.7-inch 2:1 FullVision display, complete with rounded corners for both looks and some degree of protection. The V30's display is marketed as FullVIsion too, but LG has made a switch to OLED, P-OLED to be precise. It's an 'active matrix' just like the next one, LG points out, just don't call it AMOLED. It's a 6-incher, so there's some expected size gap between the V30 and the G6 on paper. But, in real life, the V30 is actually the sleeker device of the two thanks to a curved front panel, a thinner body and its impressively low weight. Believe it or not, the V30 is, in fact, lighter than the G6. Around back, you won't find the V10's rubber, or the V20's aluminum, it's all glass this time. True to the V-series traditions however, the V30 has undergone MIL-STD-810 compliance testing (14 out 25 tests passed, if you need to know) implying increased drop and impact resistance. More importantly, the handset is IP68 certified for dust and water resistance, a first for an LG V phone. Previous generations prioritized the removable battery over environmental sealing. LG makes a big deal out of its new camera - yes, it's a dual setup similar to the ones on the G5, G6, and the V20, yet it's unlike any of those. The primary cam, the 16MP unit that's not ultra-wide, is treated to a superior lens with a glass element up front and an f/1.6 aperture, the brightest on a smartphone. The super-wide shooter is 13MP, same resolution as on the G6, but with a wider aperture too - f/1.9 vs. f/2.4. Sadly, the front-facing cam is still a measly 5MP. You'd be better off sticking to mirror selfies with the rear cam. Display: 6.0" P-OLED, 2,880x1440px resolution, 18:9 (2:1) aspect ratio, 537ppi; HDR 10 compliant. Rear camera: 16MP f/1.6 primary camera with 71° field of view, OIS, laser phase/contrast detection autofocus. Additional 13MP f/1.9 wide-angle camera with 120° FOV, no OIS, fixed focus. 2160p/30fps video recording on both. Front camera: 5MP, 90° FOV; 1080p/30fps video recording. Chipset: Qualcomm Snapdragon 835: octa-core CPU (4x2.35GHz Kryo 280 & 4x1.9GHz Kryo 280), Adreno 540 GPU. Memory: 4GB of RAM; 64GB storage; microSD slot for cards up to 2TB (practically up to 400GB). Battery: 3,300mAh Li-Po (sealed); QuickCharge 3.0 fast charging; WPC&PMA wireless charging; Qnovo battery tech. Connectivity: Single-SIM, Dual-SIM available in certain markets (mostly Asia); LTE-A, 3-Band carrier aggregation, Cat.16/13 (1Gbps/150Mbps); USB Type-C; Wi-Fi a/b/g/n/ac; GPS; Bluetooth 5.0. Misc: Fingerprint reader; Hi-Fi Quad DAC; 2 mics, single speaker on the bottom; 3.5mm jack. The G6 or V20, both of LG's previous top models have a 5MP selfie camera, and so does the V30. Maybe it's time to move on? On top of that, Korean makers keep refusing for some reason to put stereo speakers in their high-end devices - that's a beef we've had with the Galaxy S8, and now the LG V30 too. Are the designers that pressed for space or is it something else? And with designers and Galaxy S8 already mentioned, it may be worth pointing out that the V30 could easily be mistaken for an S8 head on. We'll be examining the differences, of which there are a few, of course. Join us on the next page for the unboxing and a detailed look at that beautiful Moroccan Blue V30 we have for review. If the phone is made of glass what would you expect??? there is a native fm radio app. Download it and you are ready to go.